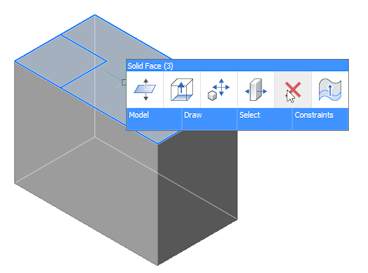 This section describes direct modeling operations offered by BricsCAD. These operations are available from the Quad tool. The Align UCS tool ( ) launches the UCS command with the Face option selected. If the UCSDETECT system variable is ON, the UCS is aligned automatically to the currently highlighted face. The UCS-icon changes accordingly. Press the TAB key to select an obscured face. Click the DUCS field in the Status Bar to toggle the dynamic UCS feature. Adds volume to, or removes volume from the solid by cursor movement or direct distance input. Cylindrical, spherical, conical and toroidal faces of a 3D solid or surface. Linear and circular edges of a 3D solid or surface. Whole 3D solids, surfaces, and other entities. Moves the selected geometry using a vector in the XY- plane of the current UCS. When a face or an edge of a solid or surface is moved, adjacent faces and edges are adjusted to preserve the correct solid/surface topology. Rotates the selected geometry around an axis. 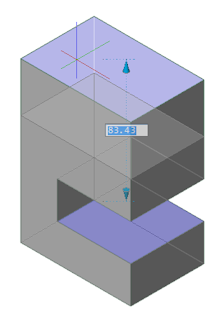 When a face of a solid or surface is rotated, adjacent faces and edges are adjusted to preserve the correct solid/surface topology. Simplifies geometry and topology of selected entities or their subentities. 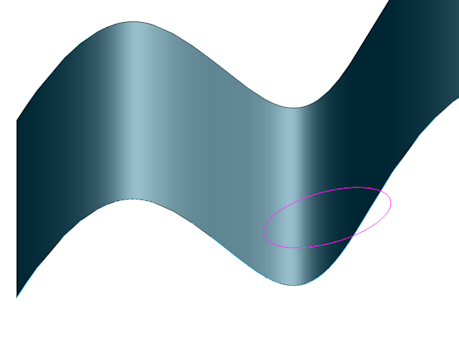 Stitches disjoint surfaces into a single 3D solid or a single surface. 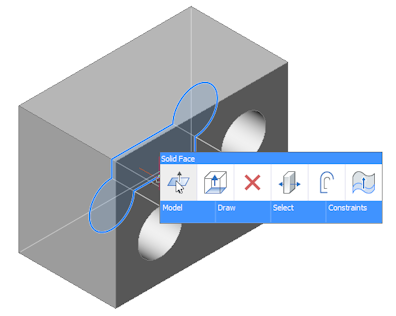 Checks and fixes geometrical and topological errors in ACIS solids and surfaces. Aligns the UCS to the selected face. Creates solids by extruding the selected 2D entities or boundary. Planar faces of 3D solids and surfaces. 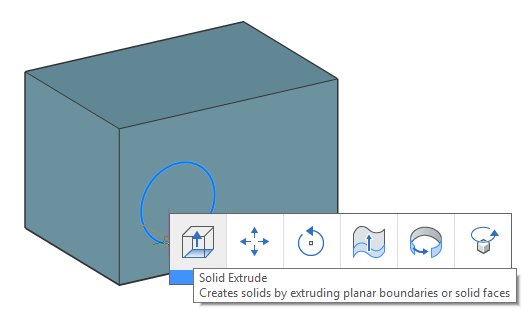 Creates solids or surfaces by extruding the selected 2D entities or boundary. Optionally the created volume is unified with or subtracted from the solid. Creates a solid or a surface by revolving a 2D entity about an axis. Adds volume to, or removes volume from the solid. Optionally the added volume is created as a separate solid. 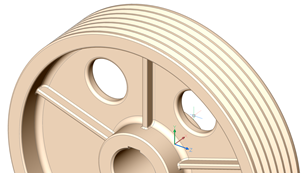 Creates solids or surfaces by revolving the selected 2D entities or boundary. 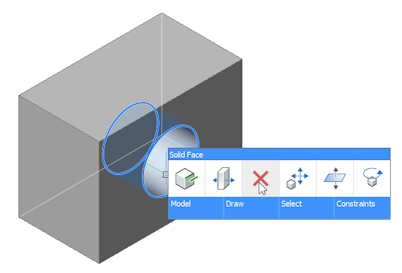 Extracts a set of 3D solid or surface faces as a new 3D surface object. Copies a feature (protrusion or depression) represented by the selected faces from one 3D solid to another, or to a different location on the same 3D solid. Creates new 3D solids by thickening faces by a given value. Creates a new 3D solid by thickening the whole surface. Creates a new 3D solid by sweeping a circle along the selected wire. 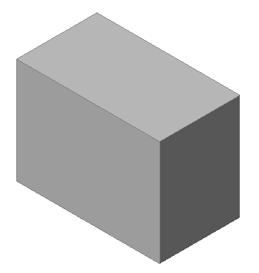 Sharp edges of a 3D solid or surface. Creates a fillet between adjacent faces sharing a sharp edge(s). 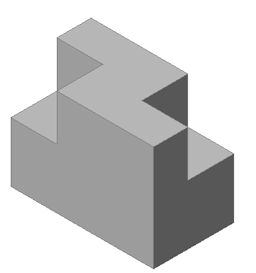 Creates a chamfer between adjacent faces sharing a sharp edge(s). Faces of a solid or a surface. Whole 3D solids and surfaces. Deletes the selected entities. When faces of a solid entity are deleted, the gap is filled by extending the adjacent faces. When faces of a surface entity are deleted, the gap is filled only if the faces form a fillet. 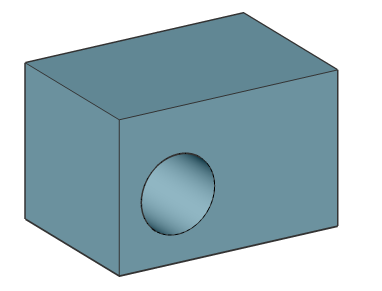 If the selected free edges belong to one or more holes in the surface, then these holes are deleted and the gap if filled automatically. Deletes the edges between coplanar faces, thus unifying the faces. Creates surfaces by extruding the selected curves and edges in a particular direction, which is defined heuristically, but can also be set by the user. Creates surfaces by revolving the selected curves and edges around the selected axis. Deforms faces by moving and rotating their edges. Deforms faces by changing the geometry of their edges. Command to modify an object by twisting a portion around a given axis by a certain angle. Selects edges and faces of 3D solids or surfaces based on their geometric and topologic properties; i.e. selects faces of a smooth side of a given solid or selects a set of faces forming a protrusion or depression feature. * If the Select detected boundaries option of the SELECTIONMODES system variable is ON, boundaries which are enclosed by 2D linear entities in the XY-plane of the current UCS, are detected automatically. When the Quad cursor menu is active, the SELECTIONPREVIEW system variable is neglected, unless a command prompts to select an entity (see Selection Settings). Hit the TAB key to select obscured geometry. The SELECTIONMODES system variable controls which subentities highlight: edges, faces and/or detected boundaries. If a direct modeling command is entered at the command prompt or selected in a menu or toolbar, you need to press the Enter key (or right click) to conclude the selection procedure. If launched from the Quad cursor menu, the command is executed when you click to confirm the selection of the currently highlighted geometry. 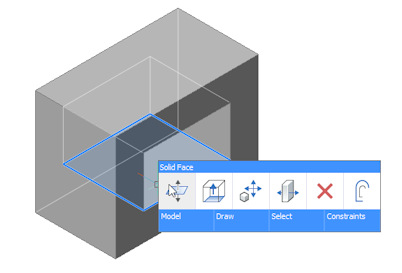 Window selection: Pressing the CTRL key during window selection allows to select faces or edges of 3D solids and surfaces. An icon next to the cursor indicates what will be selected. Protrusion or depression features, such as holes, pockets, extrusions or ribs. 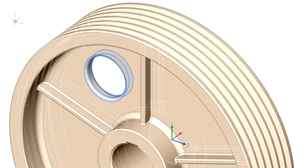 The value of a particular length, area or radius can be taken from a selected edge/face. When using the dmPushPull command a dynamic dimension displays. Make sure the Quad and Dynamic Dimensions or ON. Hover the cursor over the face you want to move. Choose PushPull ( ) in Direct Modeling command group of the Quad cursor menu. The selected face is attached to the cursor and a dynamic dimension field displays the relative distance. (Option) repeatedly hit the TAB key to see the distance with respect to an internal face, parallel to the selected face (left) or the bottom face (right). Press and hold the SHIFT key while hitting the TAB key to reverse the display order of reference faces. Type a value in the dynamic dimension field, then press Enter. Typically holes are made using the SUBTRACT command. When push-pulling a closed 2D entity that lies on a face of a solid, a hole is created when you push the 2D entity through the solid. Make sure Dynamic UCS is active. Move the cursor to the face of the solid you wan to create the circular hole in. The UCS automatically aligns to the face the cursor is on. Draw a circle on the face of the solid. Hover over the circle, then choose Extrude ( ) in the Model command group of the Quad cursor menu. Push the circle inside the solid. 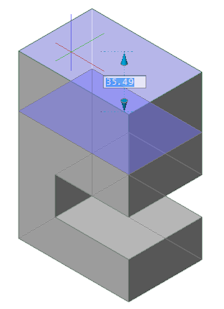 Type a distance in the dynamic field to define the depth of the hole. Push the circle through the solid to create a through-hole. (option) Choose Push/Pull ( ) in the Model command group of the Quad cursor menu to modify the radius of the hole. 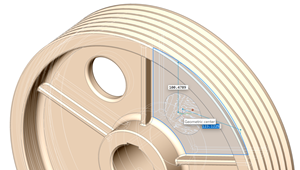 (option) Use the dmDistance3d command to apply distance constraints between the side faces of the solids and the center of the cylindrical surface of the hole to control the position of the hole. 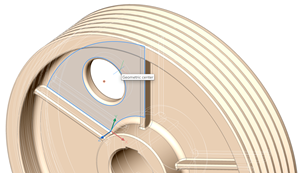 (option) Use the dmRadius3d command to control the radius of the hole. Create a 2D closed entity, e.g. an ellipse. Hover over the 2D entity. Choose Extrude ( ) in the Model command group of the Quad cursor menu. Extrude the 2D entity in the direction of the surface. Press the CTRL key twice to select the Subtract option of the DmExtrude command. Click to create the opening. To delete a hole, you must delete all internal faces and/or surfaces of the hole. Hover over the cylindrical surface of the hole. Choose Delete ( ) in the Model command group of the Quad cursor menu. Hover over one of the visible internal faces of the hole. 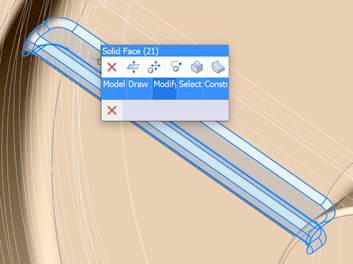 Drag the selected face to close the hole. Hover over the back (bottom) face of the recess. If the face is obscured in the current view, hit the TAB key untill the face highlights. Choose PushPull ( ) in the Model command group of the Quad cursor menu. Drag the face outside the solid. Hover over the edge of the opening. to delete a depression (hole or pocket) or a protrusion feature (extrusion or rib). Select one or more faces of the feature you want to delete. Click the Protrusion ( ) or Depression ( ) tool button in the Select panel of the Solid ribbon tab or in the Select command group of the Quad. Click the Erase ( ) tool button. When two or more faces are made coplanar, e.g. using the PushPull command, it might be necessary to remove the shared edges. ... moved to the top face, creating three coplanar faces. Choose Delete ( ) in the Model command group in the Quad. The shared edges are deleted and the three selected faces are unified. 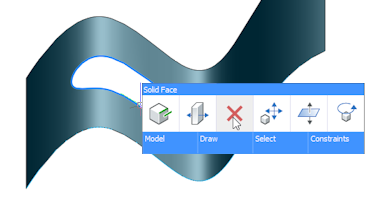 the dmCopyFaces command allows to copy one or more features of a 3D solid, such as depressions (holes, grooves, pockets) or protrusions (extrusions, ribs) to a new location on the same or a different 3D solid. Select all faces of the entire feature(s) (see Selecting Geometry). Make sure dynamic UCS is enabled. It is recommend to always keep DUCS enabled when using the Direct Modeling toolset. on the ribbon: Solid | Edit | Copy Faces . on the Direct Modeling toolbar. Use the Rotate option to rotate the faces around Z axis of the UCS. Use the Multiple option to insert the multiple copies of the selected feature. Specify the insertion point. The feature is copied from the base point to the insertion point taking into account the dynamic UCS used to select both points. 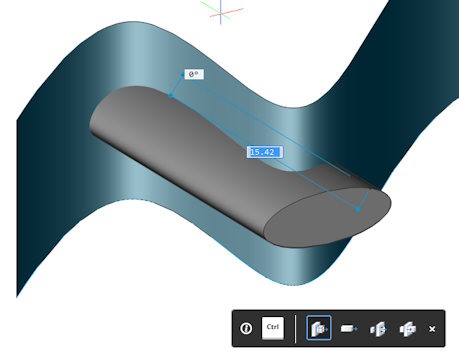 Using the tools on the Deform toolbar, you can create complex aesthetic shapes from simpler ones by deforming a set of adjacent faces of 3d solid or a surface. The initial continuity between deformed faces (G1 – tangent faces, or G2 – curvature continuity) is kept during deformation. 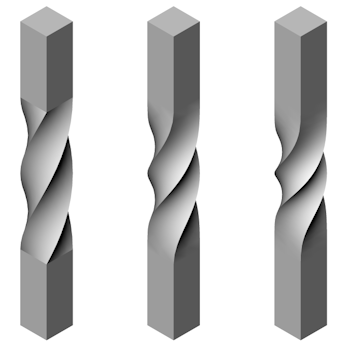 For a twist deformation it is possible to specify the continuity between the deformed and the fixed portion of the entities. 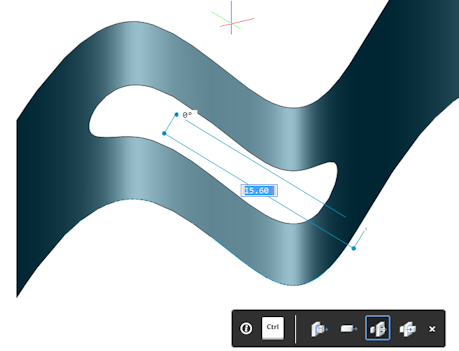 By replacing an edge with a given 3D curve.